Join the discussion on our forums! Come discuss Inkmaster Solia over in our dedicated Inkmaster Solia discussion topic. Finally got it(from the pack)! So the thing is I just packed a golden one of her. Seriously don't know what I'm gonna do with it. Seems like a decent card, but I think I'd rather have the dust. Just want to make sure if she even is good before I dust her? Little help? She's decent in N'zoth kazakus mage, but i would definitely disenchant her. thanks J. Ejsing & E. Amundsen for great artwork! 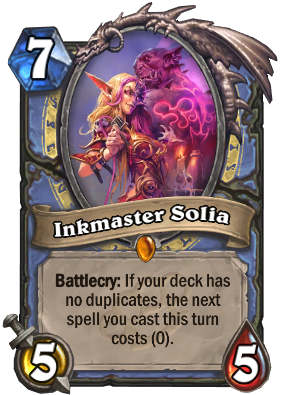 I have all the cards you would put in a reno mage deck and yet inkmaster solia still can't make the cut. Even if you were gonna run a spell based one with medivh, she just isn't good enough. I haven't dusted her because she might be worth keeping one day, but there are no situations where you've played kazakus, taken a 10 mana spell, and had inkmaster solia on turn 7 and had an opportunity to play her. Very weak card that appears incredibly strong. Of course the right cards could save Solia from Wild but it's hard to tell now. Two weeks later, even silly people now understand this card is extremely weak, and cherry-picked like comboing her with Pyroblast won't change anything on that. Two mediocre cards could never become a foundation of a great deck. Still has some of the best card art in the game though. Wish I had her in my deck. Only silly poor people who don't own Inkmaster, like you, call it weak. I'm legend on 2 (NA and EU) servers and have seen many Inkmaster reno decks these days, on both servers. This card is only useful for playing Kazukus's 10 cost spell. It still affects one spell only. Your next spell costs 0, then it costs 0 again because you can't cast a spell between the two battlecries. This card, oh man I first thought this card was absolute trash, til I started playing about 30 games with this card. Most of the time, I have used Kazakus for the 10 mana potion, and then used Inkmaster Solia to turn the tempo tide to gaining the board and having a 5/5 minion on board. Not mention using board clears and then playing this minion for tempo gain, and possibly winning the game. I currently play a Reno Freeze mage and I'm rocking a pretty high winrate with it so far. Kazakus into Emperor Into Alexstraza into Solia + Pyro blast + iceblock. If the enemy doesn't instantly reno afterwards it's GG. What makes this particular combo disgusting is not only are they forced to deal with Alexstraza immediately otherwise GG. Even after they burn their spells to deal with Alex they're followed up with yet another 5/5 that's going to kill them. Even after they burn resources trying to kill the 5/5. They now have to heal themselves to deal with a Kazakus card, and or a burn combo of fireball + torch + the frost blast. Combine this with Cabalist's tome and the high likelihood that you have yet another power blast . . . once you reach turn 8 the enemy is on an extreme downward slope that they have to put constant pressure on while you're sitting comfortably with a Reno + ice block. What makes this even more beautiful is you can turn around and deck out high draw face decks and reverse it into making yourself a tank, and or switch to a more early game with Khazakus and proceed to burn the enemy face + establish board control against face/tempo/zoo decks while using Alex + Kazakus + Solia as a means to keep yourself alive + board control etc. This deck is extremely versatile and so far I think Solia solidifies this deck as a tier 1. I know Strifecro and the others are currently calling her trash. But, I just want you guys to think about this . . . I spent a long time telling my legend tier friends that Yog Saron was going to be S+, and was even laughed at by Trump and Strifecro. Two months later they were crying about how OP/broken Yog Saron is while I was casually collecting FREELO with my golden Yog before they caught on. So far the only deck I really had trouble with was a priest I drew poorly on, and if I had Reno I would have won. I have also beaten the mythical control warrior. But tbh, most of them are currently face warriors because Reno Freeze Control Burst mage isn't high up on the popularity totem pole right now and people are busy yoloing with Druid and Face Warrior which this deck actually deals with pretty well. I'm glad I spent the 6k dust + 12 bucks to make this deck and this card makes the deck Godly. The top link is the top part of the deck, the bottom link is the bottom. I couldn't capture it all in one picture.